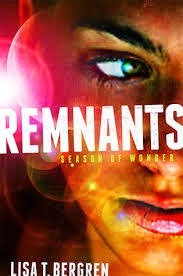 Julie: Remnants was a great, action-packed read with an oo-la-la romance brewing. Why’d you choose to add a spiritual aspect to it? Lisa: To me, there’s a spiritual aspect to all of life. It’s what rounds out everything, from love to heartache, triumph and trial. Without it, there’s a piece of the pie missing. And in a dystopian setting, thinking about the end of the world as we know it? At that point, humanity would have drawn the lines on the whole God-thing pretty firmly. Either you’d turn your back on the Maker or be desperately seeking Him. Julie: That reminds me…Why’d you call God “the Maker”? Lisa: Well, I’m a Christian, but I didn’t want names to be a hang-up. I wanted the series to be a good read for anyone, regardless of where they are (or aren’t) on the path of faith. Julie: Yet you don’t come across as preachy. I appreciate that. Lisa: I hope not. I strive to create natural characters, reacting realistically to what they’re facing. I think it may be why I draw readers who haven’t yet decided what they think about God, which is fine by me. I love it when people are just open to considering the spiritual aspect of life, open to honest conversation. If we’re not open, not growing, not learning, we begin to stagnate, don’t we? Julie: True! *considers notes* Hey, what do the two brothers, Kapriel and Keallach spiritually represent? Good vs. evil? Are they set up to represent Christ and Satan? Am I reaching too far there? Lisa: They’re spiritual powerhouses for sure, but they’re human. I was thinking of the way we are all pulled toward good or evil, and the idea of twin brothers embodying that fork in the road fascinated me. As the series evolves, readers will see that neither one is either perfectly good or perfectly evil. Kapriel is constantly dragged back by the dark, and Keallach is constantly pulled forward by the light, just like us. Julie: Talk to me about the spiritual battles in the story. Do you believe there are angels and demons fighting for our souls? Lisa: I believe there is an unseen realm that we humans spend little time considering, but should. Once you begin walking the road of faith, it’s like you put on glasses that allow you to see more and more of it. But I don’t get hung up on angels and demons, because my soul has already been won, and there’s enough to deal with here in our physical world. But are there battles? Yes. Every day, every hour. Julie: There’s a lot of YA fiction with angels and demons. Did that influence you? And will you up their presence in the next books? Lisa: There is a lot out in the market—readers are clearly intrigued by the supernatural. Demons exist to drag us from the path of light; angels exist to protect us on the path and encourage us onward. Given that the Remnants are all about fighting off the dark and leading others toward the light, angels and demons will logically take a bit more stage time with each book. But our human characters will remain the focus. Julie: I’m studying about the different gifts we’re given in 1 Corinthians, and it struck me how each of the Remnants has a distinct gift that the Maker gave them and they are to use it for his glory and purpose. Is that where you got it from? Lisa: Exactly. I pursued this theme in the Gifted series too, because I think it’s so important. I’m autographing books to readers as “one of the Remnants, with her own gift,” because every one of us has been divinely gifted, whether we know it or not. Julie: And I loved how you show that working together, they can get nearer to accomplishing their goals. Thank you again Lisa for being here and discussing the Spiritual aspects of REMNANTS! Collect all the clues and fill out Lisa’s Rafflecopter form on her launch tour post at LisaBergren.com at the end of April and you could win either a Kindle Fire HDX ($229) or iPod Touch ($229)! Wow what a great interview! I'm so glad God is using you Lisa to show their is a spiritual battle around us and how God gives each of His children gifts! What a great interview!!! I love how she said, "without it, there’s a piece of the pie missing." YES! So very true! My favorite thing she said was, "But I don’t get hung up on angels and demons, because my soul has already been won, and there’s enough to deal with here in our physical world." I find that thought so comforting. Thanks for stopping by Juju, I always love to read your comments!! Off the top of my head I would have to go with "Redeeming Love" by Francine Rivers (Christian Fiction I know, I don't read a lot of Fiction). What an amazing way to tell a biblical story that even the "mainstream" readers would gravitate to! Spiritual book - can't think of one - I agree Francine Rivers does have some that I've read. Hi Eliza! Isn't it hard to come up with a book when a person reads so many? I always liked Lori Wick and Dee Henderson for their ability to share the gospel in their writings. Loved the interview! I would also have to go with Francine Rivers books. I highly enjoy reading books from Jill Eileen Smith and Mesu Andrews, as well, for their spiritual/biblical content. Hi Lora! Have you tried any of Tosca Lee's books? I absolutely loved HAVAH the story of Eve. While it is fiction it just had me thinking so much more about the feelings of Adam and Eve when they were kicked out of the garden. Very thought-provoking. Thanks for stopping by! Book looks great! Can't wait to read. Hi Ashley! I really enjoyed it and definitely look forward to the next book in the series to see how everyone's lives unfold. Thanks for stopping by! I hate to say it, but I don't think I have read a spiritual book. Only the bible of course. The River of Time books. They were good weren't they Daisy? I like Max Lucado books :) Thanks for stopping by! I can't think of anything. Some books have posed spiritual questions that I decide if I agree with or not. Other than that nothing sticks out. I really love how Lisa intertwines her Christian faith in her books without preaching the gospel. She infuses her characters with a healthy blend faults and a heart questing to know God better. Thank you Mrs. Bergren! This was very encouraging and exciting! Can't wait to read it! Remnants Wonder(ful) Weekend! I love how you have spiritual aspect in your books. As a Christian it's hard for me to find good YA books because they all have stuff I don't want to read about in them. This interview has me even more excited to read Remnants!